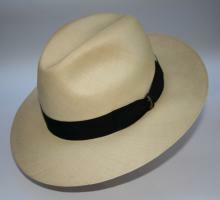 MONTECRISTI Panama is an entirely handmade hat of unmatched elegance, a pure marvel of lightness and snowy whiteness. Its incomparable value stems from the number of "turns", or twists that that the Artisan weaves: in fact, the more turns, the better the quality. It takes at least 6 months to make only one of these hats. Following the tradition of the Panama, the hat is produced in Montecristi, the famous town in Ecuador, and is made only from Toquilla Palmera leaves, damped by the dew and harvested in the early hours of the morning.